Bay Shipbuilding Corp., a subsidiary of The Manitowoc Company, Inc., r e c e n t l y d e l i v e r ed ahead of schedule the 550-foot Energy Freedom to Universal American Shipping Corporation of Greenwich, Conn. 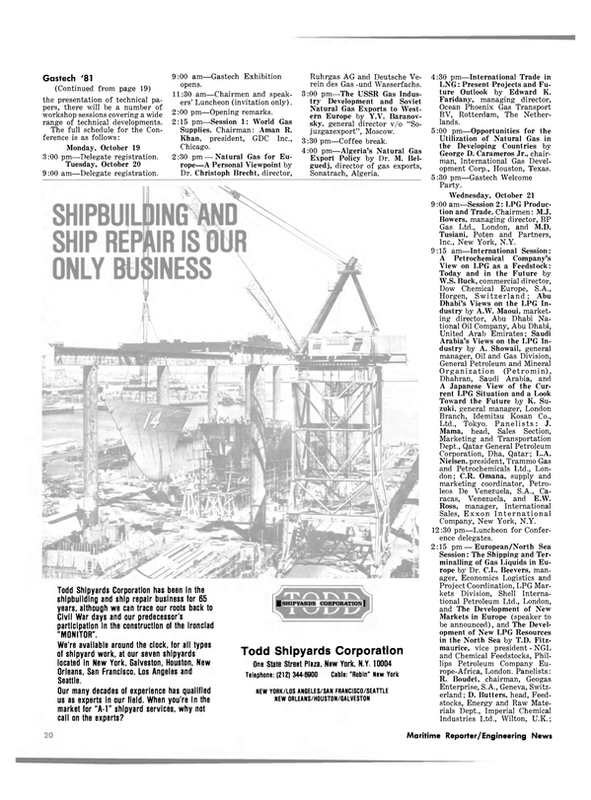 The Energy Freedom was d e s i g n e d , engineered and built by Bay Shipbuilding Corp. in the record time of nine months and seven days from the date of contract commitment. Universal American Shipping Corporation's p r e s i d e n t , Karl Meyer, commended the shipyard for the outstanding delivery performance, high quality of workmanship and for not initiating a single shipyard change order. Universal American has chartered the Energy Freedom to New England E l e c t r i c S y s t em f or carrying coal from the ports of Hampton Roads, Baltimore and Philadelphia to its Brayton Point station in Somerset, Mass., and Salem Harbor station in Salem, Mass. The name Energy Freedom was chosen for the new jumbo bulk barge because of the charterer's plan to drastically reduce its dependence on foreign oil. In its first year of service, the coal that the Energy Freedom will carry will displace five million barrels of oil, saving New England Electric System's customers an estimated $50 million. The Energy Freedom loaded its first coal cargo at Conneaut, Ohio, only a few days after delivery. Energy Freedom has an overall length of 550 feet, beam of 78 feet, depth of 50 feet, a total hold capacity of 1.5 million cubic feet and a summer deadweight cargo capacity of 33,700 tons. The vessel is American Bureau of Shipping classed + A - l for unrestricted ocean service. The vessel, with Bay Ship's unique hull design form and with Gulf Fleet's tug Gulf Majesty, attained speeds over 12 knots in a ballasted condition on its maiden voyage. The barge is fitted with 13 individual lift-off type hatch covers and a 15-ton Marine Travelift, Inc. hatch crane. Electrical power aboard the barge is provided by two Caterpillar/KATO 130-kw g e n e r a t i n g units controlled through a Bay Shipbuilding Corp.-designed and built switchboard. Two 4,000-gpm ballast pumps and a 250-gpm general service pump were supplied by Johnston Pump Company. The a n c h o r w i n d l a s s and mooring winches were supplied by New England Trawler Equipment Co.
Motorola, Inc. supplied remote controls that will allow the tug to release the anchor. The vessel has two adjustable skeg rudders of which the hydraulic units and cylinders were provided by Great Lakes Fluid Power. The twin-screw 149-foot motor vessel Gulf Majesty, with 7,200 brake horsepower pushes the barge from a 60-foot- deep stern notch. The tug was fitted at Bay Shipbuilding Corp. with a secondary 49-foot raised pilothouse. Bow and side bumpers were installed to convert the tug from a towing to a combination notch / towing tug. The Energy Freedom is the third of five ocean petroleum and bulk carriers recently contracted to be built by Bay Shipbuilding Corp. of Sturgeon Bay, Wis., one of which is a 44,000 cargo deadweight self-unloading phosphate carrier. Mr. Meyer commented that Energy Freedom is the most efficient coal carrier for the U.S.
coastwise trades and it is the first of a planned fleet of large ocean barges. Universal American Shipping Corporation is committed to participate in the U.S. coal movements.